The XTERRA Elliptical Trainer FS2.5 is a highly ergonomic, smooth, comfortable exercise model that has a number of different programs and levels of resistance for all levels of fitness. The trainer is featured for under $300 on amazon and has a number of features to consider. Users can easily monitor their heart rates while working out on this trainer in order to get to the optimum levels in any workout. The trainer can also be moved easily with front transport wheels. The magnetic resistance system has no friction so it is quiet and maintenance free at all times. This elliptical made it to our top picks for the Best Elliptical Machines of the year. There are a lot of good features on the XTerra Elliptical, but a few stand out above the rest. The 16 different resistance levels allow users to customize the trainer to their level of fitness or even what level of energy they have that particular day. The resistance also allows users to vary their workouts to work different muscles harder some days and give themselves a break on other days. The trainer also features 13 different programs, which allows users to use the comfortable elliptical motion in a number of ways. The programs vary the resistance levels to make the users feel like they are going up hill or are battling the machine in several other ways. The programs can even be customized for the user’s benefit. In order to keep an eye on heart rate, users can grip the comfortable hand grips and have their pulses taken at the same time. The convenient location of the pulse sensors on the handle bars makes sense. The user does not have to shift in order to have their pulse taken. They simply grip the handles in a comfortable location and continue their workout. No user has to worry about the sounds they will make on this trainer. The magnetic resistance system is friction free and gives a smooth, quiet ride every time. The system is also maintenance free and will not make more noise once it has been used for several months or even years. This trainer is a great fit for many different users. The model is very inexpensive, making it a great fit for many budgets. The trainer also does not take up much space compared to other models, which allows it to fit into smaller spaces within the home. The quiet aspects of the trainer allow it to run without disturbing other elements in a home and the smooth, steady sound keeps it in line with noise levels. The oversized pedals allow each user to place their feet where they are most comfortable and they also allow one size to fit all. The front transport wheels let users move the machine around in their homes with ease by simply picking up the back and wheeling it to a new location. The trainer can be used in a front or backward motion, giving it more versatility for each user and a variety of exercise options. There are also options in terms of programs and resistance levels. There are 16 resistance levels and 13 different programs. These features can help to keep a user motivated and muscles guessing as to what might come next. With the synchronized upper and lower body motion, the trainer gives a flue motion that does not jar the body in any way. This helps to prevent knee problems or injuries and other side effects from normal running such as headaches. Though the machine is small, it is very sturdy and will not collapse under heavy use. The bright screen attached to the front of the trainer allows users to easily enter information and choose programs. The Xterra could have a cup holder to help users stay hydrated during a workout. The screen could also be larger to enable users more ease in choosing programs and settings. The machine also only accommodates weight up to 250 pounds so it is not usable for just anyone. And when it arrives, it takes assembly, which can be complicated for those who are not assembly-friendly. The directions were written by people who understand the product and not a user who actually has to put it together. 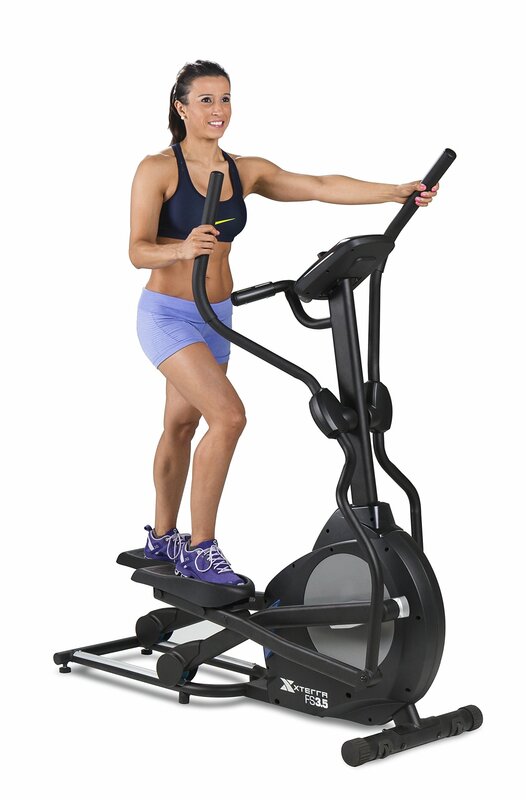 Overall, the XTerra FS2.5 Elliptical is a great purchase for the amount of money it costs. It is quite, portable, easy to use, and versatile. There are heavy duty, more expensive machines out there, but for the cost, this trainer is one of the best on the market.